Branding your brand works well if the image you project can somehow be associated with you directly. So Bruno Cucinelli® brands with natural materials, cotton bolls, twine (thread might have been too small for visual impact) and the homespun rustic impression of Italian hill towns. The coppery gold of the family crest and Logotype also echo the natural warm tones of the softwood props. Best of all, no other brand is using a similar approach, so Brunello becomes the sole brand with this image and look … a sophisticated crest and logo with natural materials. Step through the Brunello Cucinelli Fabric Roots gallery for various views, angles and focuses. 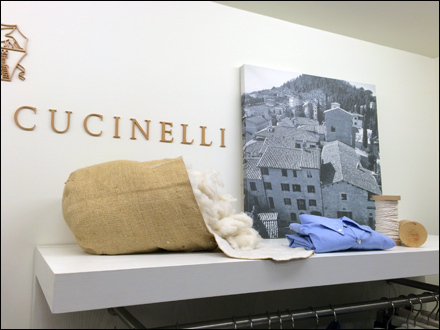 Follow Brunello Cucinelli merchandising at..